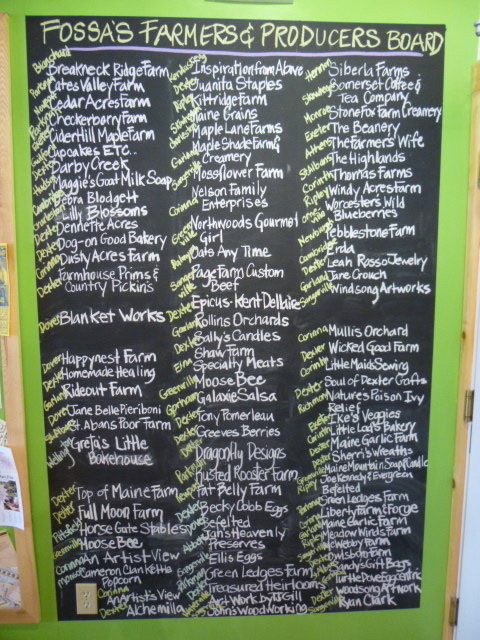 It’s no secret that farming in Maine has seen an incredible resurgence in the last 15 years. Farmers markets are flourishing, local food is on the menu at restaurants everywhere, and young people continue to flock to Maine to learn how to farm and find land. This growing “local food” movement has, in some cases, led to the revitalization of rural communities, with the growth of local stores selling local goods, and providing a community gathering place. Last Tuesday, I visited one such store in a small town smack dab in the middle of Maine. Fossa’s General Store is one of a small range of shops on Main Street in the town of Dexter, the self-described “Heart of Maine.” Although it only opened a year ago, the idea for the store has been in the works for about four years as a way to rejuvenate the downtown. The Fossa family, pillars of the community who owned a general store in the town for years, gifted the building to the Dexter Regional Development Corporation. Although the Fossa family isn’t involved in running the store anymore, the store name is a tribute to their legacy. The store does have a bit of an old-time feel, but walking in feels more like a shift in way of life than a trip back in time. You can still smell the fresh wood from shelves that are filled with jars of jam, hand-made jewelry, even beauty products. 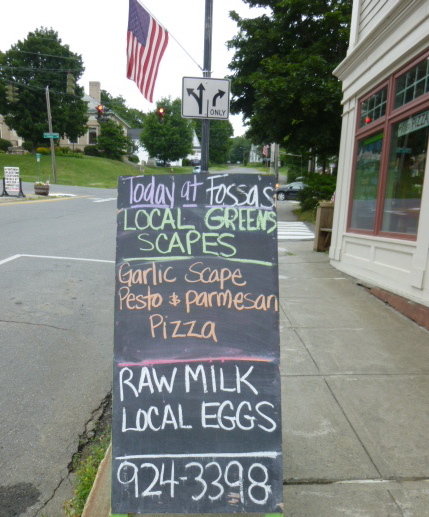 A chalk sign advertises garlic scape pizza from the wood-fired oven, and the hum of a refrigerator points the way to local milk and a freezer full of a locally-raised meats. 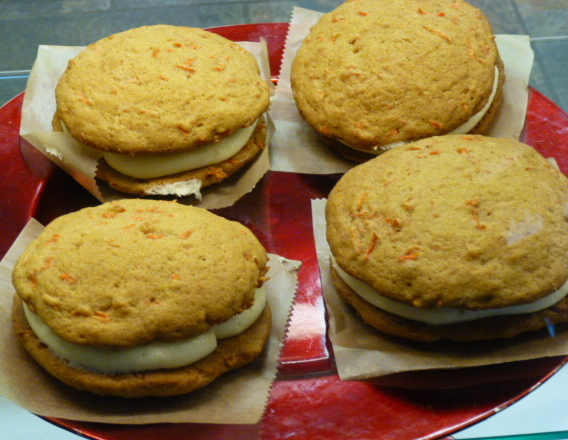 I spent a little time admiring the carrot cake whoopie pies in the display case, then was shown upstairs to talk to the force behind the operation. Behind the desk was a fervent, friendly woman. I quickly gathered that Judy Wilbur Craig is a big part of why Fossa’s exists today. A Dexter native, like her parents and those before them, she loves her town and wants to keep it vital for future generations. Tucked away in central Maine, away from the picturesque Maine coastline, Dexter isn’t set up to take advantage of tourists, even the growing number of food tourists who might be interested in a rustic farm-focused grocery like Fossa’s. But that’s not the point of the store anyway: Fossa’s wants to sell local goods to local people. 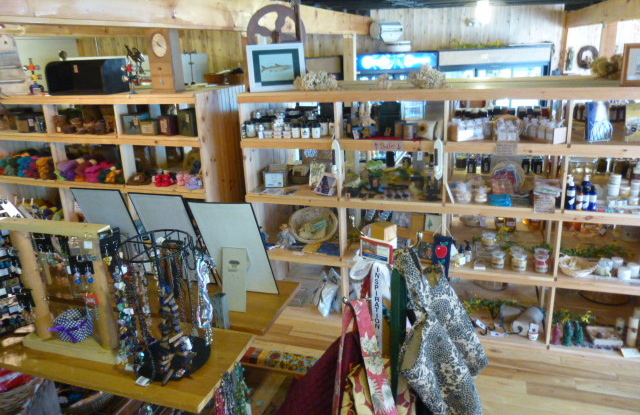 And the region has a lot to offer—from Maine-grown flour to iridescent fabric necklaces made by a local artist, everything in the store is from within 35 miles of Dexter. Prices are kept as low as possible to retain the local customers, and although sustainably raised meat is still more expensive to produce than what you might find in a supermarket, growing consumer appreciation for transparent sourcing has kept sales steady. Judy hopes that there can be more projects like this in other communities. She’s eager to help other people who come to her for advice on starting similar stores in other towns. With time, perhaps stores like Fossa’s will flourish throughout the state (and indeed, similar ventures are cropping up all the time). I left with a huge bag of garlic scapes, 5 lbs. of whole wheat Maine-grown and milled pastry flour, and 2 lbs. of Jacob’s Cattle beans. I didn’t intend to make my journey into a shopping trip, but I just couldn’t resist the products, the prices, or the idea of supporting development in this little community. If I can help sustain a good project and have a few extra tubs of garlic scape pesto to line my freezer, life is pretty good.